Great and on target. Thanks. Thanks so much for this insightful piece – and the hope that is there — in the parishes, if not in the conclave!! 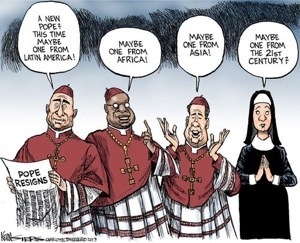 And I’m with the cartoon nun – hoping for a 21st Century Pope! Sister Joan Chittester and Fr Richard Rohr come to mind as candidates.